Uncle Sam, worldwide icon of the United States government, is of humble origin. During the War of 1812, Troy, New York meatpacker Samuel Wilson supplied beef to the US Army, stamping his barrels “U.S.,” for United States. But tongue-in-cheek, soldiers quickly rebranded the letters as standing for “Uncle Sam”—and thus the symbol was born. “Uncle Sam” Wilson himself was admired for great fairness, reliability, and devotion to friends and country, qualities long associated with the United States. 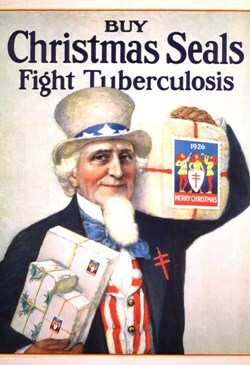 Garbed in his signature top hat and red, white and blue, Uncle Sam urges, “Buy Christmas Seals, Fight Tuberculosis.” This 1926 poster by the National Tuberculosis Association is part of NLM’s collection. Note on Uncle Sam’s lapel is the Association’s anti-TB emblem, the double-barred Cross of Lorraine. You can find this poster and thousands of other images by going to the NLM Images from the History of Medicine database.